The Chico Food Project is a fun and simple way to share food with the hungry in our community. We come to your doorstep 6 times per year to pick up your blue bag filled with non-perishables and leave you an empty bag for the next pickup. We are over 1,000 members strong and we collect over 11,000 lbs. of food at each pickup. The food is given to the Chico Food Locker, the Jesus Center, the Salvation Army, Vectors For Veterans, St. Vincent De Paul and CSUC Hungry Wildcats. Currently in Butte County, one in five households are at or below poverty level. That means there are a lot of Chico families who are hungry. Seventy-five percent of single moms and their children live in poverty. Food pantries have been overwhelmed by the demand and are in desperate need of a continual supply. 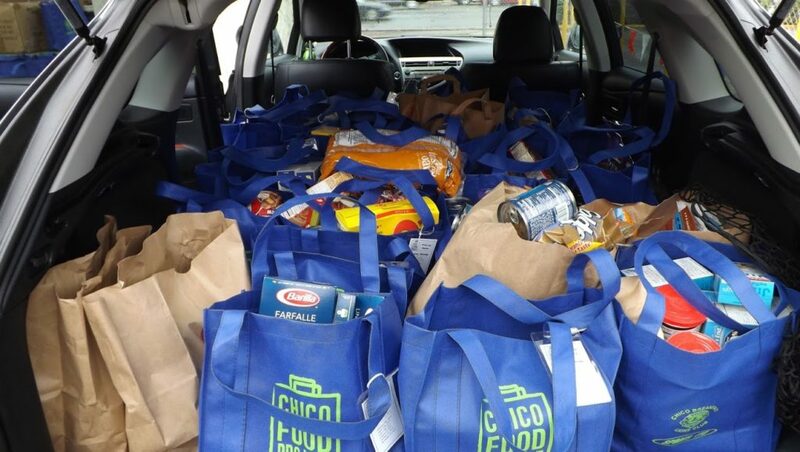 Chico Food Project is a door-to-door food collection program formed to help provide non-perishable items to existing Chico food pantries six times a year. There are 3 ways to help Chico families. Ask for a beautiful blue bag. We estimate that for every 300 people who participate, we collect one ton of additional food a month. It all starts with you and our blue food bag. Ask your neighbors to get their own blue bags to fill as well. What Do You Do with those Beautiful Blue Bags? Each week when you go shopping, buy one non-perishable food item. Store your non-perishable food items in your food bag. On the second Saturday of every other month, a volunteer will pick up the bag, leave another bag in its place, and then take the filled bag to food pantries. You buy one extra non-perishable food item each week; we do the rest!